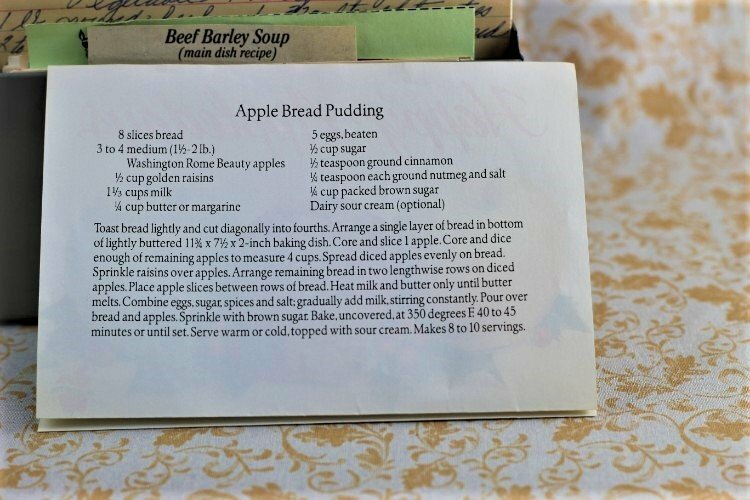 Front of the recipe card for Apple Bread Pudding. There are lots of fun recipes to read in the box this recipe for Apple Bread Pudding was with. Use the links below to view other recipes similar to this Apple Bread Pudding recipe. 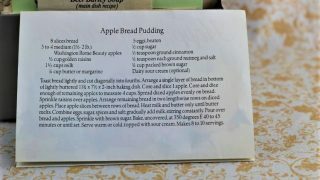 If you make this Apple Bread Pudding recipe, please share your photos and comments below! Toast bread lightly and cut diagonally into fourths. Arrange a single layer of bread in bottom of lightly buttered 11¾ x 7½ x 2-inch baking dish. Core and slice 1 apple. Core and dice enough of remaining apples to measure 4 cups. Spread diced apples evenly on bread. Arrange remaining bread in two lengthwise rows on diced apples. Place apple slices between rows of bread. Heat milk and butter only until butter melts. Combine eggs, sugar, spices and salt; gradually add milk, stirring constantly. Pour over bread and apples. Bake, uncovered, at 350 degrees F 40 to 45 minutes or until set. Serve warm or cold, topped with sour cream.